Recently I picked up my longboard from the barn where it was in hibernation for quite some time. I have been cleaning the bearings and other necessary maintenance. All the while looking out the window checking if the weather was adjusting to the meteorological time of the year: spring! Why this urgent need to skate? A long answer short: this split record! These two bands play pure skate punk and do this with such conviction that, even though the weather is not really inviting yet, I just had to get ready for the season. Symphony Of Distraction has the honor to open this record. They do so with a rant against their current president, titled “Call It Off Don”. It’s fast, it’s catchy and lyrically it’s as in your face as it can get. 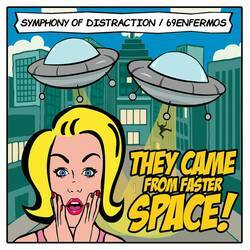 Symphony Of Distraction is from New York, but sounds like they would rather live on the other side of the country. To me at least it sounds like they are heavily influenced by the Californian skate punk scene. You can hear this is underground punk; the production is audibly low budget and it is not a selling point. Especially the snare sound is a bit too loud to my liking. It does not distract too much, but the whole sound of these five songs could have been more balanced. Before this release I was unfamiliar with the band. After some desk research I discovered they have some experience under their belts with a couple of previous full lengths. I haven’t had the chance yet to look into that, so I cannot tell you how the five songs on this split compare to their previous work. I can tell you that I intend to find out in due time. That is mainly because of the gem that is called “Chug”. That song alone is worth buying this split. I absolutely love it. On to side B, where 69 Enfermos is ready to entertain you with another five songs. 69 Enfermos is originally from Columbia and now operating from Brazil. They have been active for quite some time. After forming the band back in 1995, they released their debut full length in 2003. Not a lot of bands in this scene are active this long. I am not a big fan of the band, but after consulting Discogs I realized I had checked out their previous three full lengths. Based from those experiences I can conclude that this band is really dedicated to keeping the traditional 90’s skate punk sound alive and kicking! Their sound has not changed over time, just refined. It’s as energetic as it has always been, and that is something that I look for in a skate punk band. The reason that I am not that into this band is their singer. In my opinion he lacks power a bit. Again, this is not too distracting, but it kept me from buying their previous output. As this is a very personal preference I encourage you to check out for yourself if you like this band or not. If you like the songs on this split, you will definitely be happy with a backlog like theirs still to discover. This split is keeping scene alive. It offers nothing new, but it doesn’t have to. Both bands enjoy what they are doing and you can hear that in their music. Both sound energetic enough to make me want to skate. That’s exactly how it should be. We are not here for the innovation, we are here for a soundtrack for a skate ride! Fans of the genre should definitely get this (the CD is sold for a very reasonable price and the digital version is name your price on bandcamp (but come on, support your scene, lads and lasses!)) and can add at least ten points to the score. Posted April 8, 2019, 10:06 p.m.